I can’t rave enough about the information and support I’ve found here, and in the Infant Acid Reflux Solutions Facebook group, and how much it means to me and my family. My daughter is 4 months old and has been struggling with silent reflux probably since birth but wasn’t diagnosed until she was 6 weeks old. She was in the NICU for 35 days after she was born and no one caught it. She would gag/choke during feedings, usually towards the end; she would scream after a feeding but then seem ok after she burped, she was a very good eater and would often act as if she was never satisfied, constantly wanting to eat. She could take way more than what was “normal” for her age and would basically want to “snack” all the time. I was worried she was overeating but the nurses and doctors didn’t seem concerned. She would cry a lot when she wasn’t being held and only seemed content if she was in the mamaroo swing. They attributed ALL of this to her condition and the medication she was on at the time. So at 6 weeks I told her doctor about her behavior during and after feedings and she immediately suspected reflux. We tried to avoid medication at first and I did as she asked and gave it some time but it only got worse. The first time I watched my baby scream because she was hungry but couldn’t eat without writhing in pain I knew I would do anything to make it better. So we tried Zantac for a couple weeks until it stopped working and then we switched to Prilosec (12mg per day). I could tell a difference in her daytime behavior, her sleep, but while I was glad she felt better, not all of her symptoms were resolved. She would still hiccup constantly, I could hear wet sounds in her throat, and watch her grimace when she swallowed. We switched to Nexium (5mg ONCE a day) but I immediately knew the dose was not high enough!! I began researching that day and found this site by that night. I had heard of Marcikids dosing and it just made sense to me. I was rocking my baby while completing the questionnaire for my free consult but didn’t really know what to expect. Suffice it to say I was very surprised when I received an email from Dr. P within the HOUR!! He agreed my daughter absolutely has reflux and he said something in his response that I truly appreciate... I had been kicking myself for having her medication changed from Prilosec to Nexium (since the Prilosec had been helping some) and had mentioned that she was “doing ok on the Prilosec “ in my questionnaire. Dr. P said that “the goal of treatment was to make the symptoms go away...for them to be resolved 80-90%... significant improvement. It was good knowing that my expectations weren’t unreasonable. His assessment was that my daughter needed a higher dose of the PPI (18mg a day) in order to fully resolve her symptoms. I trusted Dr. P and his experience in infant reflux immediately and chose to follow his recommendations. .
Now, we’ve only been using the pharmacy compound for a week so I can’t say for certain how it’s working as far as resolving most of her symptoms.. but I can say that having access to the Facebook group where I can ask questions and have others, including Dr. P, respond is honestly the best part of this whole experience. Prior to finding this site I was so confused about medications and how/when to administer them. I was clueless on how to best help my baby. I was given zero information by her doctor and even less by the pharmacists who filled her medications. It was so frustrating!! Everyone acts as if infant reflux, silent or otherwise, is completely normal and not at all anything to be very concerned about. Being told to wait a couple weeks “to see if the medication helps” when it’s at it’s lowest possible dose or being told that “she’ll grow out of it eventually” doesn’t help when I have a hungry baby screaming in pain in my lap. 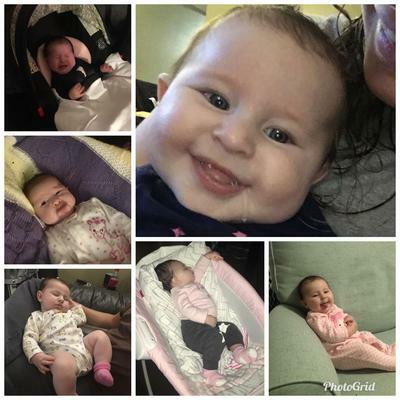 But now, thanks to Dr. Phillips, Kiri Volpi, and all of the others who GIVE so much of their time to make this site and this group what it is, I have a happy, smiling baby girl who is well on her way to (hopefully) being free of her reflux symptoms. Comments for Helped my baby smile again! Thank you so much Brittney. We are so happy you found us too and we look forward to hearing when your baby is doing great. We know it's coming soon. We're here for you in the meantime!